Westmoreland Coal Co. entered into an agreement to acquire the Prairie and Mountain coal mining operations from Sherritt International Corp. for $435 million. These include seven producing thermal coal mines in Canada’s Alberta and Saskatchewan provinces, and a 50% interest in an activated carbon plant and a Char production facility. “This is an historic event for Westmoreland,” said Westmoreland Chairman Keith E. Alessi. “The acquisition represents a transformation to our existing operations and expertise—this will more than double our business,” in one of the world’s most attractive mining jurisdictions. The combined business will be the No. 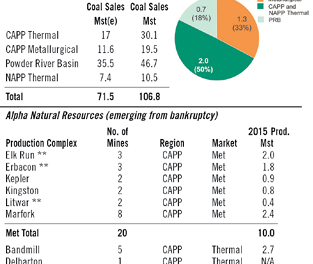 6 North American coal producer, as measured by 2012 production, according to company officials. Westmoreland CEO Robert P. King was similarly enthused. “This acquisition, significantly enhances our asset portfolio and positions us as the leading mine mouth coal producer in North America,” he said. 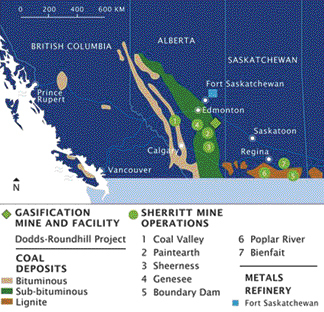 The Prairie operations consist of six operating surface mines within Alberta and Saskatchewan and control mining rights to 654 million coal tons of Q4 2012. In 2012, Prairie operations delivered 22 million tons of low-sulfur thermal coal to domestic utilities. Mountain operations consist of one surface mine in Alberta that produced 4 million tons of low-sulfur, thermal coal in 2012, primarily for export, and one surface mine currently in reclamation. Mountain operations hold an aggregate reserve of 22 million tons of coal as of Q4 2012.